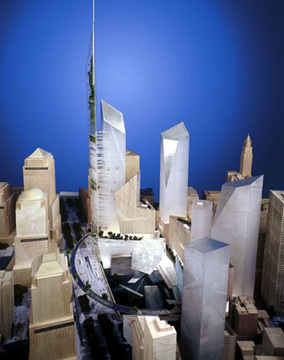 On December 18, 2002, the Lower Manhattan Development Corporation presented a second group of plans for the redevelopment of the World Trade Center site. The first group of plans presented by the corporation earlier in the year (see The City Review article) met with considerable negative public reaction and lack of enthusiasm. The New York Times Magazine published a separate group of proposals (see The City Review article) as did New York magazine (see The City Review article). The corporation then invited new proprosals and received more than 400 and narrowed them down to proposals presented by seven architectural teams, which included some of the world's most famous architects such as Sir Norman Foster, Daniel Liebeskind, Skidmore, Owings & Merrill, Richard Meier, Peter Eisenman, Steven Holl, Raphael Vinoly and others. 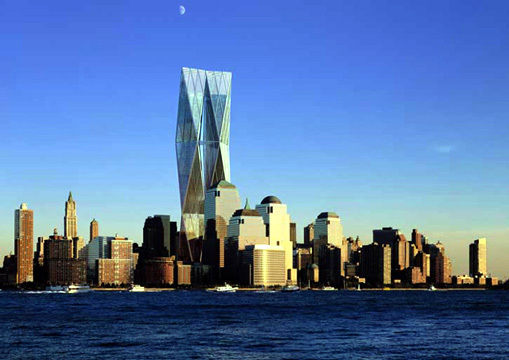 Because of controversy over the original notion of replacing all the commercial space on the site that was the target of the September 11, 2001 terrorist attacks and because of concerns that the Lower Manhattan office market could not easily absorb all that much space, the competition for the second group of designs lowered the requirement of commercial space significantly. Interestingly, four of the seven new proposals call for structures taller than the World Trade Center, a reflection of widespread public opinion that the skyline and the city deserved something monumental. 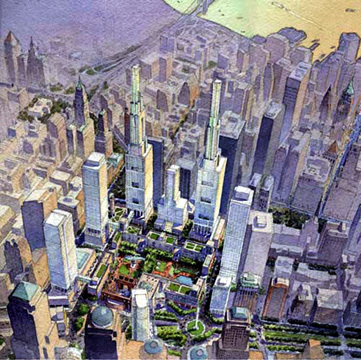 The Lower Manhattan Development Corporation's website, http://www.renewnyc.org, has descriptions and illustrations of each of the proposals including large "slide" shows prepared by each of the architectural teams. "The rebuilding of the World Trade Center site is the most important urban planning and architectural challenge of our time. It is about healing, repair and rebirth. We have a duty to commemorate the dead in the form of a solemn and respectful memorial. We have a duty to repair and regenerate the city fabric. Above all, we have a duty to symbolize the rebirth of New York on the skyline, to demonstrate to the world the resilience, the resolve, the strength and faith in the future of all those who are dedicated to liberty and freedom. The footprints of the two destroyed towers provide sites for the international memorial competition. Monumental walls of steel and stone will create a sanctuary for private remembrance and reflection. From within these tranquil spaces only the sky will be visible - no buildings or trees. Surrounding the memorial sites will be a new World Square-a large green park. "The renewal of the World Trade Center site can be the catalyst for the regeneration of the whole of Lower Manhattan. We can repair and rebuild the neighborhood street pattern that was eradicated in the 1960s. Fulton Street and Greenwich Street will be extended and revived. We can reinvent Liberty Street as a vibrant street market. Instead of a barren plaza, there will be streets on a human scale lined with shops, restaurants, cinemas and bars to ensure that the area has a life around the clock. "We can also strengthen connections further afield by integrating New York's public transport system. Below ground, there will be a New Multi-Transportation Center, providing Lower Manhattan with the centralized transport facilities that exist in Midtown. This new gateway into Manhattan will be marked by a glorious glass canopy - a celebration of public transport. "The iconic skyline must be reassembled. 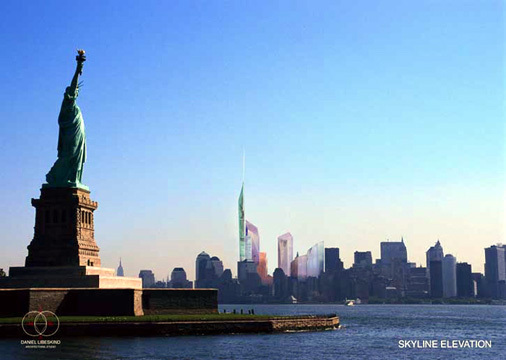 We propose to celebrate New York's positive spirit with a unique twinned tower - the most secure, the greenest and the tallest in the world. This is a huge responsibility because human safety must be paramount. Immediately following September 11th Foster and Partners commissioned an expert multidisciplinary task force to conduct an in-depth study into safety in tall buildings. Their findings inform the design of this new structure. "The crystalline tower is based on triangular geometries - cross-cultural symbols of harmony, wisdom, purity, unity and strength. Its two halves kiss at three points, creating public observation platforms, exhibits, cafes and other amenities. These links also have a safety benefit, as escape routes from one tower to the other. They will break down the tower's scale into village-like clusters, each with its own atrium. These tree-filled spaces - parks in the sky - will purify the natural air that will ventilate the building. A state-of-the-art multi-layered facade will enable the towers to avoid energy-wasting air conditioning for up to 80% of the year. The building's raking corners offer the opportunity for funiculars to transport the public vertically up the building. "Our plans meet the needs for remembrance, reconciliation and renaissance. The memorial will be a lasting reminder of the value of human life. The new streetscape represents our belief in the highest quality of urban living and the new towers' socially and environmentally progressive agenda will symbolize New York's commitment to a better future." This proposal by the world's most famous "high-tech" architect calls for twin, 1764-foot-high towers that would "kiss" at three points. The forms of the towers are based on triangular rather than rectilinear angles. The design is spectacular and its apparently steel and glass faceted facade would perpetuate the sparkling aesthetic of the original twin towers. While the design is certainly dramatic, it is a bit ungainly. The angled towers almost appear to shudder. They are exciting, but perhaps almost too energetic. The notion of the "kiss" skybridges is good, but the design would perhaps be improved if the two towers had a larger separation. "Our proposal is to reconnect the city by creating a dense grid of vertical structures that support multiple strata of public and cultural spaces. Our vision is one that moves beyond the historical drive to build high only in order to maximize the limited resource of land, it is one that builds to multiply that very resource for the greater public. Our proposal covers 16 acres, and in turn, returns those 16 acres twice, by providing within its various horizontal strata, 16 acres of sky gardens and an additional 16 acres of cultural space. "We believe that the future of the global city must provide substantive solutions for increasingly densified space; space for public, space for culture and the vitality of commerce that will support those resources and needs. In our proposal, the legible icons are the striations of space, rather than commercial structures. 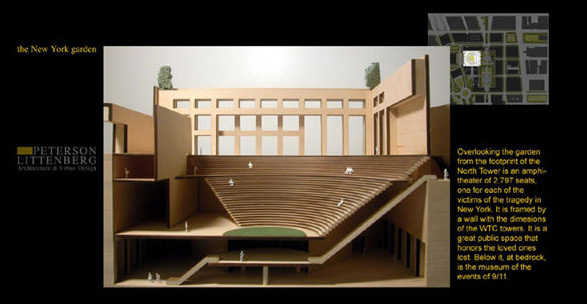 The main idea is that the architecture supports public and cultural space, the specific shapes are works in progress. All buildings are shaped for the greatest public good, each dynamically enhances views, connections, light, and seeks to lessen the impact of wind and sound. "Our proposal reaches beyond the historical exchange of equal commerce for equal land. It doubles the return in our quest for quality of environment. And in turn gives Lower Manhattan a larger expanse of square footage dedicated to cultural activity than the sum of all the city's existing cultural spaces. It does this with the greatest efficiency, economically and environmentally. It provides for more than adequate retail and commercial space and does so by creating betterment for the public good. It also provides sites for an international memorial competition. Together the green spaces at the various public strata act as natural systems promoting the exchange of carbon for oxygen. 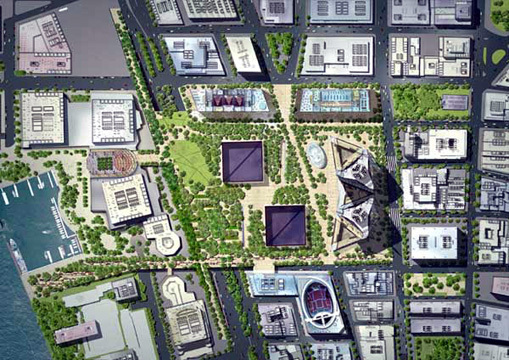 The program as a whole, by virtue of its water feature, is self-reliant, recycling the precious resources of water as well as functioning as heat exchanger diminishing energy costs throughout the project as well as moving beyond 'sustainability' and will be a power contributor to the city. This is a paradigm for the future, and has never really been done on this scale before. "At the very top is the final public stratum, a horizontal plateau elevated above the skyline providing a "Trans-horizon" for the resurrected global city. It is a real space that extends itself horizontally rather than vertically and symbolically reaches beyond the confines of the city to all the surrounding horizons. At this vertical plateau the buildings act together both as a public space for contemplation and observation, and as an interactive transmitter and receiver for communication, information and media exchange. They respond to our most recent technological and economic imperatives to produce continuity and networks culturally, environmentally and economically, all at both global and local levels. "As such, we present our proposal as a design for new horizons built on elevating the public good above the ruins of tragedy." A very ambitious plan, this proposal is very dense and offers considerable high-rise public spaces and environmental benefits as well as being able to be built in many phases. While it does not seek to erect the world's tallest building, it probably calls for more mass than any of the other proposals. The bent towers would undoubtedly offer very exciting street-level views but would also obstruct many of their own high-rise vistas, although the vertiginous views would be interesting. While it is an intriguing proposal, it does not achieve symbolic grandeur. "The moral obligation in rebuilding Ground Zero is not just how best to remember those who perished in this tragedy, but how to make their memory the inspiration for a better future. The issues at stake in planning the site have a local dimension as well as global repercussions; therefore the design should address the specific conditions of our city from a perspective that could also transcend its limits. "Ground Zero should emerge from this tragedy as the first truly Global Center, a place where people can gather to celebrate cultural diversity in peaceful and productive coexistence. Finding the proper balance between the two main objectives of the project - Remembrance and Redevelopment - depends on the way in which investment in the public infrastructure contributes to the Renewal of Lower Manhattan. Since the level of funding will influence the design characteristics, we have developed three different planning concepts - Sky Park, The Great Room and The World Cultural Center - in order to demonstrate the impact of a range these possible levels of investment. "An inspired plan will rededicate our City to the ideals of diversity, democracy, and optimism that have made New York the World's Center for the exchange not only of goods and services, but also of creativity and culture. "A ten block, 16-acre rooftop Public Park is a living memorial that floats above the familiar scale of the New York City street grid. Connecting to the Grand Promenade along West Street and beginning at street level across from St. Paul's Chapel, the Park gradually climbs to ten stories and culminates in a cantilevered three-acre lawn with sweeping views of the Hudson River and the New York Harbor. "The Memorial location is defined by the open squares of the footprints of the WTC Towers and includes the space above, below and surrounding them. "The Park includes groves of trees, an amphitheater, cafes, an ice-skating rink, fountains, community gardens and multiple sites for additional Memorials. Ramps, pedestrian bridges (including one to the Winter Garden), escalators, and a "vertical pocket park" elevator provide convenient connections within the Park and to the street. "Located below the Park, in typical city blocks are cultural facilities (adjacent to the footprints), street level retail (in addition to retail on the concourse level), a Transportation Center, a hotel/convention center, and office space. "On the Park's perimeter, three large office towers (including the world's tallest) complete the program in subsequent phases. 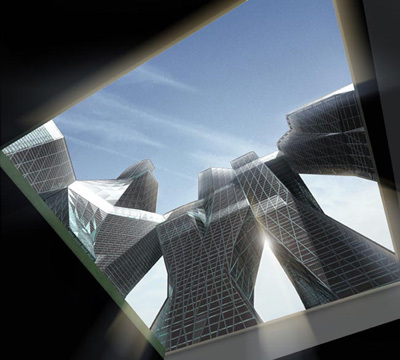 The towers are designed as independent buildings and rise high above the Park to redefine the skyline of the City. "The Great Room is a vast, covered Public Plaza connecting all the elements of the program under an enormous free-span glass ceiling. A soaring living memorial, encompassing 13 acres, serves as the Gateway to the City and as the Great Hall of the Transportation Center-an unprecedented place for arrival, celebration, memory, and civic events. "Two glass cylinders protect the footprints of the WTC Towers as they surround and articulate the Memorial site and the entrance to a 9/11 Interpretative Museum. "Utilizing the large area of the roof and the space that it covers, sustainable systems conserve energy and collect rainwater to reduce consumption and produce solar energy. Stacking shutters regulate the natural ventilation of the space providing the opportunity to control ambient temperature. "Phased mixed-use buildings define the perimeter and support the roof. The tallest structure in the world (2,100 ft), including offices, hotel and a transmission tower, completes the program, is a counterpoint to the Great Room, and redefines the skyline of the City. 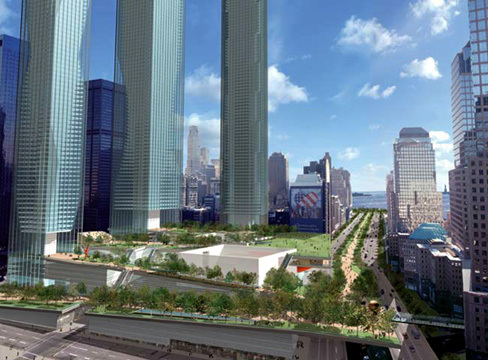 "The World Trade Center is reborn as the World Cultural Center. Built above and around the footprints of the World Trade Center towers, but without touching them, two open latticework structures create a 'site' for development of the Towers of Culture. "Within these soaring structures, distinctive buildings designed by different architects are phased to complete a program of innovative cultural facilities: the Memorial (from the footprints of the original towers to the top of the highest platform in the world), the 9/11 Interpretative Museum, a Performing Arts Center, an International Conference Center, an open Amphitheater, viewing platforms and public facilities for education Arts and Sciences reconstruct the skyline of the City with the icons of the Public Realm. The Towers emerge from large glass reflecting pools that bring natural light to the retail and transit concourse. Two large-scale turbines harvest wind to power the elevators of the Center that will serve 8.5 million visitors a year. "The Transportation Center occupies the memorable space between the towers. Retail is located at both the concourse and street levels to better serve the community. Eight independent mid-rise office buildings and a hotel on the perimeter of the site fulfill the total program according to market demand." This plan comes closest to replicating the basic form of the original World Trade Center, albeit with transparency and a much more complex development at its base. While the proposal adequately addresses the symbolic needs of the site, its interesting base is perhaps too complex and the costs of the transparent sections of the towers may be prohibitive. "In the tradition of Rockefeller Center and Union Square, we propose to build a great public space for New York City at the World Trade Center site. We call this Memorial Square. While the 19th and 20th century precedents for urban plazas are contained spaces, our 21st century Memorial Square is both contained and extended, symbolizing the connections of this place to the city and to the world. 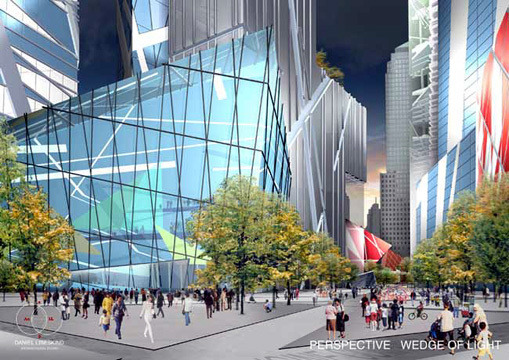 Memorial Square is defined on the east and north sides with hybrid buildings that rise 1,111 feet, restoring the Manhattan skyline with geometric clarity in glowing glass. At ground level these buildings form a unique array of ceremonial gateways leading into the site. These thresholds of reflection open onto Memorial Square, a place that supports daily activities while allowing moments of contemplation and silence. "To the west, two glass-bottom reflecting pools demarcate the footprints of the former World Trade Center towers. Beneath them, the volumes of the footprints become sites for memorial rooms lit from above. The pools overlook two memorial groves of trees, planted to mark the final shadows cast by the towers moments before each fell. Nearby, new proposed cultural facilities include a Memorial Museum and Freedom Library, a Concert Hall and Opera House, and Performing Arts Theaters, which frame the edges of the site. "Memorial Square sets a precedent in its potential for multiple memorials sites, beginning with the ground plan. These sites will be the locations for an international memorial competition. Given the nearly 2,800 people who died here and the thousands more who were physically and emotionally scarred by the horror of September 11, we believe that it is not necessary to contain or divide the site, but to expand it by extending into the surrounding streets. This is achieved through a series of "fingers," reminders that the magnitude of what happened here was felt far beyond the immediate site. At the same time, they facilitate connections between Memorial Square, the waterfront, the proposed NYC Transit Center, and greater Lower Manhattan. Laid on the existing grade, the stone-paved fingers are also visual and acoustic reference points. "The essence of the ground plan reappears in the composition of the buildings, which only occupy 27 percent of the site, leaving the remaining twelve acres to be developed as public space. The two buildings comprised of five vertical sections and interconnecting horizontal floors, represent a new typology in the tradition of innovative skyscraper design. In their quiet abstraction, the buildings suggest screens of presence and absence, encouraging reflection and imagination. The cantilevered ends extend outward, like the fingers of the ground plan, reaching toward the city and each other. Nearly touching at the northeast corner of the site, they resemble the interlaced fingers of protective hands. "An architecture of dignity is not only possible here, it is absolutely necessary. In the belief that from a monumentally tragic occurrence can come to life-affirming opportunity, Memorial Square is a place of living memory, a sacred precinct where loss is remembered and renewal is celebrated." This is the only proposal that seizes upon the great visual element of the 9/11 tragedy, the shards of the World Trade Center's structural facade. The interpretation is not literal, but nonetheless is quite meaningful and the lattice design also offers the advantages, as did the plan of Foster & Partners of providing skybridges. This is probably the best design, although having the five vertical towers all topped at 1,111 feet misses the opportunity for the city to regain the title of having the world's tallest building. Perhaps the towers could be of different heights with the one at the northeast corner of the site being the world's tallest. "I arrived by ship to New York as a teenager, an immigrant, and like millions of others before me, my first sight was the Statue of Liberty and the amazing skyline of Manhattan. I have never forgotten that sight or what it stands for. This is what this project is all about. "When I first began this project, New Yorkers were divided as to whether to keep the site of the World Trade Center empty or to fill the site completely and build upon it. I meditated many days on this seemingly impossible dichotomy. To acknowledge the terrible deaths which occurred on this site, while looking to the future with hope, seemed like two moments which could not be joined. I sought to find a solution which would bring these seemingly contradictory viewpoints into an unexpected unity. So, I went to look at the site, to stand within it, to see people walking around it, to feel its power and to listen to its voices. And this is what I heard, felt and saw. "The great slurry walls are the most dramatic elements which survived the attack, an engineering wonder constructed on bedrock foundations and designed to hold back the Hudson River. The foundations withstood the unimaginable trauma of the destruction and stand as eloquent as the Constitution itself asserting the durability of Democracy and the value of individual life. "We have to be able to enter this hallowed, sacred ground while creating a quiet, meditative and spiritual space. We need to journey down, some 70 feet into Ground Zero, onto the bedrock foundation, a procession with deliberation into the deep indelible footprints of Tower One and Tower Two. "The foundation, however, is not only the story of tragedy but also reveals the dimensions of life. The PATH trains continue to traverse this ground now, as before, linking the past to the future. Of course, we need a Museum at the epicenter of Ground Zero, a museum of the event, of memory and hope. The Museum becomes the entrance into Ground Zero, always accessible, leading us down into a space of reflection, of meditation, a space for the Memorial itself. This Memorial will be the result of an international competition. "Those who were lost have become heroes. To commemorate those lost lives, I created two large public places, the Park of Heroes and the Wedge of Light. Each year on September 11th between the hours of 8:46 a.m., when the first airplane hit and 10:28 A.M., when the second tower collapsed, the sun will shine without shadow, in perpetual tribute to altruism and courage. "We all came to see the site, more than 4 million of us, walking around it, peering through the construction wall, trying to understand that tragic vastness. So I designed an elevated walkway, a space for a Memorial promenade encircling the memorial site. Now everyone can see not only Ground Zero but the resurgence of life. Base of plan has "Wedge of Light"
"The exciting architecture of the new Lower Manhattan rail station with a concourse linking the PATH trains, the subways connected, hotels, a performing arts center, office towers, underground malls, street level shops, restaurants, cafes; create a dense and exhilarating affirmation of New York. "The sky will be home again to a towering spire of 1776 feet high, the "Gardens of the World." Why gardens? Because gardens are a constant affirmation of life. A skyscraper rises above its predecessors, reasserting the pre-eminence of freedom and beauty, restoring the spiritual peak to the city, creating an icon that speaks of our vitality in the face of danger and our optimism in the aftermath of tragedy. Libeskind's Jewish Museum in Berlin is one of the great buildings of the past few decades and his ensemble here of rakishly angled towers is handsome and coherent and also capable of being erected in phases. The top half or so of the tallest and slenderest tower is given over to gardens. The asymmetrical skyline of this design is appealing. "The entire site is a monument to the tragedy of 9/11 consisting of an interconnected series of five buildings that creates a cathedral-like enclosure across the entire 16 acre site. A vast public plaza and park is formed around the connected footprints by a protective ring of towers. A living memorial will develop over time becoming both a monument to the past and a vision for the future. "Preserving the footprints of the World Trade Center, the memorial visitor descends seventy-five feet below ground along a spiral walkway to then look up through the footprints to the sky. Rather than looking down, the memorial directs visitors to look upward in remembrance. A Sky Memorial atop the first tower will allow visitors to complete the memorial pilgrimage by looking down over the hallowed ground where so many heroes lost their lives. "In the sacred space of the memorial, immense arches tower over the plaza and expansive public spaces are laid out to optimize the flow of people and create an inviting sense of openness. This integrated strategy of development serves commuters, nearby residents and tourists alike and reflects the rich urban fabric that has evolved in Lower Manhattan over the past 30 years. United Towers encompasses over 10.5 million square feet in a single contiguous building to be built in phases, the highest tower measuring 1620 feet, approximately 112 floors. 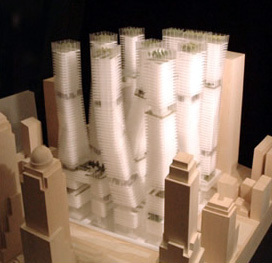 "The interconnection of the five towers provides for unique commercial and public space. For example, at 800 feet in the air, approximately the 60th floor, a multi-level "City in the Sky" connects the towers with gardens, educational centers, shopping, cafes, a sports center, a broadcast center and a conference center. The possibility of very large connected floors invites not only new public functions at unprecedented heights but also large contiguous floor plates that can attract businesses back from the suburbs into Lower Manhattan. Throughout the complex, vertical sky gardens are arranged every five floors thereby enhancing the working environment and allowing a maximum amount of sunlight, saving energy and improving the views from within. "This single building built in five phases will not only be the tallest building in the world, it will also be one of the safest. Each of the sloping towers contains multiple independent stairways, connected every 30 floors by areas of refuge. From any point in every building there are many ways for people to exit, having the option of going down, and of moving horizontally into an adjacent building. "The site surface is returned to grade where pedestrians can walk across the site freely in all directions. Greenwich Street connects Tribeca with Lower Manhattan through the site. From Liberty, Cortlandt, Dey and Fulton Streets 60 story archways frame views connecting the city to the river. The proposed underground train station is designed to promote the flow of pedestrians, avoid bottlenecks and provide a wide range of intuitive connections to the streets, the plaza and the memorial. A major five-story civic space dedicated to the multi-modal connections of MTA, PATH and Air trains is located at the same subterranean level as the base of the memorial competition site, allowing a connected experience of monumental public infrastructure and the memorial." This "megastructure" plan is very imposing and monumental. Although it is ungainly, one can imagine that some angular adjustments could significantly improve its aesthetic. The tallest tower in particular is awkward thin and almost appears precarious. The view upwards from the center is very dramatic and memorable. "This plan creates a whole new city district with many different places and experiences. "The heart of the district is a special Public Garden, whose shape and geometry are generated by the WTC tower footprints. This garden is a walled enclosure, quiet and contemplative, a place of allegory, historical remembrance, symbolism and repose. Within the garden and at other places throughout the district will be sites for an international memorial competition. "The garden is sunken below the streets and located behind the adjacent blocks. It serves as an inner courtyard for the whole city, a place of refuge. The garden contains an open amphitheater on the North Tower footprint with 2,797 seats, one for each victim of the tragedy. Underneath the theater, at bedrock, is the museum to the events of September 11. "Circling out from the garden and amphitheater are the other layers of this new city district, a rich and permanent pattern of streets, boulevards, squares, towers, parks and gardens that together form a new urbane public realm, one that can heal the city and reach out to enhance the broader civic structure of all Lower Manhattan." The tall twin towers of this proposal are anemic and fussy, although the amphitheater is laudable. The new plans met with a generally enthusiastic public response, considerably more favorable than the first "official" group. However, some observers argued that the plans were neither practical nor economically feasible. While it is true that the city's economy is in serious trouble and that these proposals are very expensive, such qualms miss the point. The Reichmanns build the World Financial Center at Battery Park City, a plan almost as grandiose. Rockefeller Center, Grand Central Terminal and the former Pennsylvania Station were also giant projects, all of which contributed very significantly to the greatness of New York City. Most of the plans, furthermore, are designed to be built in stages and if the final design is grand enough it may prove to very successful, especially if the city can find its way to improve access to Lower Manhattan with a Second Avenue subway, more ferry service and an improved link to airports. It is encouraging that the Lower Manhattan Development Corporation responded to criticism and invited new proposals. There is, however, a great deal of uncertainty about what it will do with the proposals. It has announced that it will choose a proposal from the new group by the end of January, and many civic groups have protested that that is too fast a schedule. More importantly, it has not indicated whether it will choose only one proposal or possibly try to combine elements from different proposals and it is also not clear whether any final choice will be adopted by the Port Authority of New York and New Jersey or Larry Silverstein, the developer who has a long-term lease on the site. Mr. Silverstein recently presented plans by Skidmore, Owings & Merrill for the rebuilding of his skyscraper, 7 World Trade Center, that was demolished in the terrorist attacks. The final decision on what to build on the site is crucial to the city's future. If it is not spectacular and awe-inspiring, a very great opportunity will be missed, one not likely to be ever duplicated. None of the new proposals is perfect, but there are some intriguing designs that do hint at exciting possibilities. It is clear at this point that the "footprints" of the twin towers of the World Trade Center should not be built upon and should form an important part of the memorial component of the site. It is also clear that the site should contain at least one super-tower, and there is no reason the city should not regain the title of having the world's tallest building. West Street should be covered over with a park. The rationale behind the two groups of towers in the Meier/Eisenman/Gwathmey-Siegel/Holl proposal is not clear but the simple "lattice" form is very appealing. Its glass facades, however, could probably use some refinement and Libeskind is very skilled at facades. The angled megastructure approach of the United Architects' plan could probably be applied at the base here effectively and the amphitheater of the Pederson/Littenberg plan should also be incorporated, a notion that Peter Eisenman actually employed in his New York magazine proposal and in a more dramatic mid-tower approach in his New York Times Sunday Magazine plan. Whether the Lower Manhattan Development Corporation will dare to combine different elements from these plans is not clear, nor whether it can subdivide the commissions. While the individual teams and architects obviously would want to design the entire plan, it is not inconceiveable that they would agree to collaborate. Clearly, the overall plan will need to be in phases. The final design should be awe-inspiring and should include the world's tallest building. It should be extremely graceful but also very exciting. It should proclaim the city's resolve to regenerate itself and the nation's resolve that freedom is paramount. It should be the centerpiece of a renaissance of Lower Manhattan. It should commemorate with dignity the tragic loss of life.